A newly established "climate road" not only accumulates rainwater, but also exploits the water’s heat potential to heat a nearby public institution. 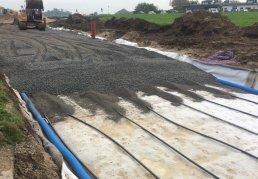 The Climate Road (Klimavejen), established in collaboration between VIA University College in Central Denmark Region and Hedensted Municipality, both collects rain and reaps the benefits of the stored heat of the water. The road is built of permeable asphalt, which lets water seep down through 800 meters of geothermal heating tubes. The tubes collect the water’s heat energy before redirecting the water to a nearby rainwater reservoir. Climate Road’s geothermal plant is connected to a local daycare center and is able to satisfy its annual heating needs – equivalent to approximately 75,000 kWh annually. With this heating boon, Climate Road is helping to climate-proof the area as well as reducing the daycare center’s heating bill through sustainable heat energy. The project will be monitored by VIA University College and will be used for teaching at the institution. The project will also become part of a teaching plan on sustainable urban development at schools. 800 meters of geothermal heating tubes run under the permeable asphalt road and accumulate heat energy absorbed by the rainwater. As an integral part of the project, Climate Road is part of a teaching process for sustainable urban development in the municipality and at VIA University College. The geothermal heating tubes make use of a natural heat source and the heat-storing capacity of rainwater in order to heat the local daycare center. The project will investigate whether heat supply through the road network can supply the surrounding dwellings with heat in the future, and make the city self-sufficient when it comes to heating. Hedensted Municipality is a municipality located on the Jutland peninsula in central Denmark.